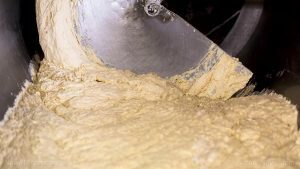 Tartaric acid esters are emulsifies used in bread processing to help the dough rise faster. Supposedly, the compound improves the texture of the bread while increasing the volume of the number of products the manufacturer can produce. Most people refer to the ester as DATEM, or diacetyl tartaric acid esters. These are derived from plant sources and are the by-products of reacting diacetyl tartaric anhydride with mono- and diglycerides with vegetable oils (usually soybean). Despite health regulatory groups classifying DATEM as emulsifiers, their functions are not yet completely understood. What scientists do know is that they operate on the air/water interface and improve the gas-holding capacity of the dough. Other than that, DATEM remains a mystery. It is this acknowledgment of the unknown that has worried independent food groups, who claim the compound to be responsible for various health concerns. The U.S. Food and Drug Administration (FDA) has deemed DATEM to be safe. DATEM is not heavily regulated. It is believed that the dough conditioner can make up to 0.375 to 0.5 percent of the weight of flour used in commercial baking. This apparent (or perhaps lazy) disregard for the potential health hazards of the preservative was seen in a 2002 study on mice. Scientists found that excessive intake of DATEM contributed to heart fibrosis and adrenal overgrowth. The conclusions of this study highlighted that there is no clear information on how the substance is made, or even what exactly is in it. This has not stopped its commercial usage however; many bread manufacturers insist on DATEM, relying on the fallacy that since there is no evidence proving or disproving its health effects, it will still continue to be used. Consumers should be made aware that DATEM is found in other items apart from bread. It is also used in dessert products such as muffins, cakes, and burger buns. The compound is likewise found in some sweets (such as Pop Tarts), as well as some cappuccino mixes. One study has linked DATEM with an increased risk of endometrial hyperplasia. This is when the lining of the uterus thickens at a rate that is unhealthy. This can lead to cancer. Another study suggests that prolonged and excessive consumption of DATEM can cause sinus histiocytosis (otherwise known as Rosai-Dorfman disease). This disorder occurs when there is an overproduction of non Langerhans sinus histiocyte (a white blood cell). These cells can accumulate and damage the lymph nodes. It is difficult to state conclusively which body systems are harmed by this emulsifier, since science still does not understand the compound’s full uses. That being said, it is linked to an increased likelihood of cardiovascular distress as well as damage to the uterus and lymph nodes. Tartaric acid esters are more commonly known as diacetyl tartaric acid esters (DATEM) and are used as a dough conditioner to make bread rise faster and improve consistency while improving shelf life. Medical scientists as well as food groups still do not understand how the compound works. As such, it is not a highly regulated preservative. Studies have linked the ester to an increased probability of developing heart conditions.